Cafes play an important role in our lives. It is our meeting places, our relaxing places, it is our social quo places (ahem Starbucks), it is our omg-I'm thirsty places. When we go somewhere, we instantly look around for a cafe or a coffee shop and relax. If there's an Urbana Coffee or a Second Cup, we know we'll be okay. Our frothy lattes, the deep leather chairs and the earthy aroma of grinding coffee beans is ingrained in our culture. We buy overpriced bottles of waters and cookies because they're in these well-lit glass counters and there's a line up of people watching us. Why not splurge? Christmas season rolls around and the cups are decorative red-and-green. Candy-cane flavoured lattes and pumpkin scones fill the shops and gift baskets filled with organic teas and dark cocoa line the windows. 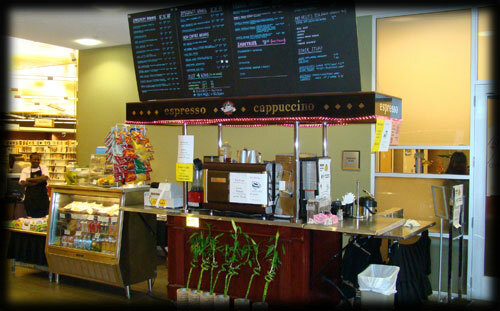 How do we take the essence of the cafe home with us? I want our little white kitchen to look like a cafe, as impossible as it sounds. What do I need? White marble counter tops? 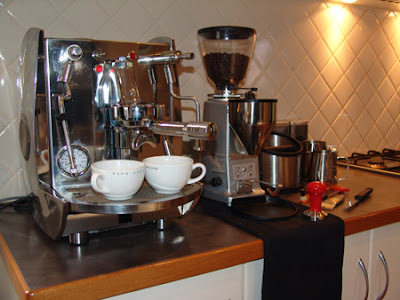 Top of the line espresso machines? A chalkboard? I want a counter with our espresso machines and mugs (Turkish coffee is something my fiancee makes well), baskets of Splenda and brown sugar and honey. I want to recreate a cafe in our home. I spoke earlier of cafe "art" but I think that is one component of the unit. A bowl of espresso beans as decor is a fantastic and great-smelling feature as well. I always see sales for espresso machines at Home Outfitters and along with a coffee machine and an electric kettle it'll be fabulous. I think the idea of having this cafe is an extra reason to wake up early! Of course, a rack of newspapers will be a fine addition, as well to the cafe. (Reminder to self: get newspaper subscription). A cafe in a home kitchen.